If you’re a fan of Touch Press’s initial eBook offerings in the iTunes App Store, The Elements and The Solar System, then you’ll appreciate their next contribution to the App Store, Gems and Jewels. 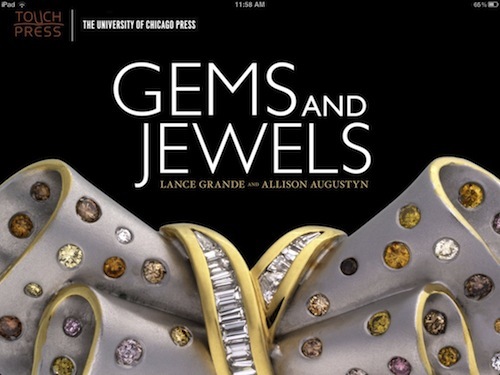 As we saw with Touch Press’s first two eBooks, Gems and Jewels provides a sensory-loaded and informative experience in the world of gemstones, jewelry, and minerals. 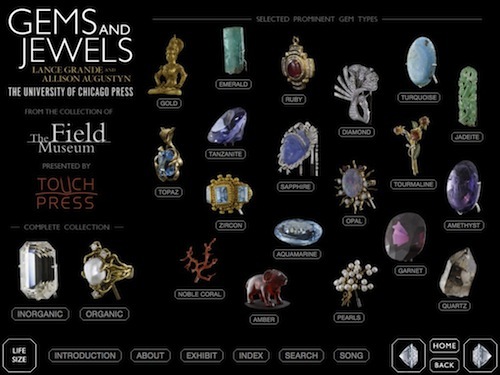 Gems and Jewels is an interactive eBook that explores the impressive collection housed in the Grainger Hall of Gems in the Field Museum of Natural History in Chicago, Illinois. 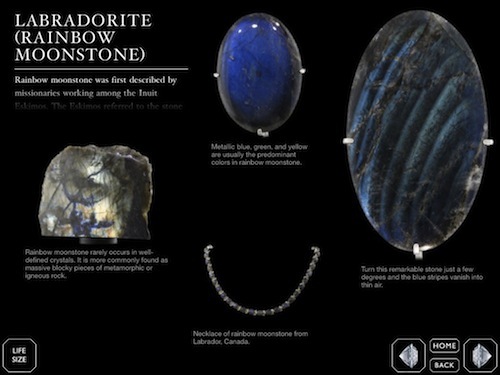 If you’re interested in mineralogy or jewelry, you won’t be disappointed. Customary for Touch Press’s eBooks, Gems and Jewels opens with a theme song. In this case, it’s Marilyn Monroe’s classic, “Diamonds Are A Girl’s Best Friend.” The home screen is filled with slowly-rotating gems and jewels, all of which can be explored in more depth with a single tap. The eBook is best experienced by going through an introduction section first. 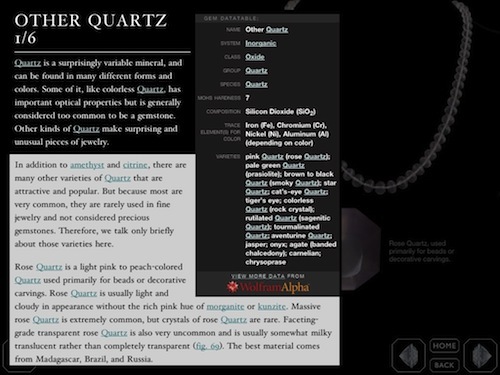 In this section, many aspects of gems and jewelry are explained. 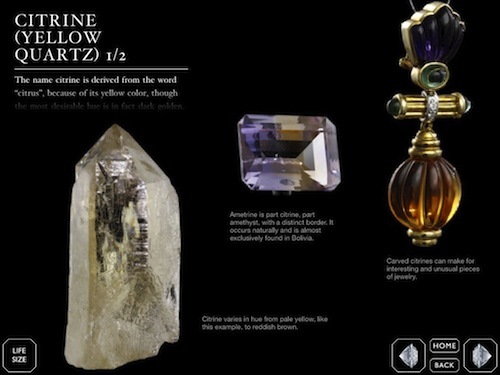 Aspects of minerals such as beauty, durability, scarcity, ethics, folklore, birthstones, synthetic minerals, and history are just a fraction of what’s explained. 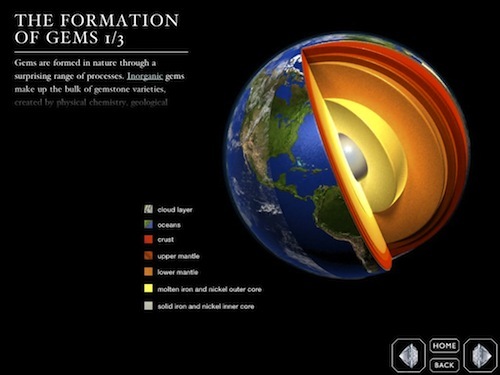 The explanations include interactive three-dimensional images that help reinforce the concepts presented. Double-tapping an image brings it to a full-screen view that can be zoomed in upon with the customary pinch gestures. There is also a “Life Size” button that compares objects in their true dimensions. The images also take advantage of the iPad 2’s built-in gyroscope by rotating images when the reader simply tilts their iPad side to side. There are a lot of small details that make the experience even better. Any tap is accompanied by a neat sound effect. The directional arrows for moving ahead or backwards page by page are actually images of diamonds whose pointed ends direct you to where you want to go. You can browse through the various types of gemstones and jewels in three ways. The Home screen, which can be accessed at any time with a single tap of the home button, has the collection divided up into various groups. Diamonds, gold, topaz, tanzanite, sapphire, turquoise, and amber are just a few of the groups you can explore in great detail. The entire collection is also divided into inorganic and organic groups. Tapping either of these options takes you to the same groups of minerals and jewelry, just in larger groupings. A third method of exploration is also available. You can take part in an interactive exhibit of the actual Grainger Hall of Gems at Chicago’s Field Museum of Natural History. The Hall of Gem’s floor plan is laid out for you and allows the reader to select any section of the hall for a closer look. The objects are presented exactly as they are in the real museum and can be manipulated just as any other images are in the app. Tapping an object takes you to a page with tons of behind the scenes information. I’ve never failed to be impressed with any of Touch Press’s offerings in the iTunes App Store. As a science teacher I’ve taken a great interest in each of their titles, and I look forward to reading the other eBooks Touch Press has to offer.